IT SEEMS CAMPAIGNER Jerry Beades hasn’t forgiven Vincent Browne over their clash on the veteran journalist’s show this week, when he was repeatedly told to “shut up”. As you’ll no doubt recall, the pair butted heads after Beades described solicitor Brian O’Donnell’s Gorse Hill home in Killiney as “bog standard”. The Land League activist was asked to either keep quiet or leave the studio when he tried to interrupt the presenter, as he tried to make a point in reply to the (somewhat bizarre) assessment of the palatial residence. It was the second row between the pair this week. 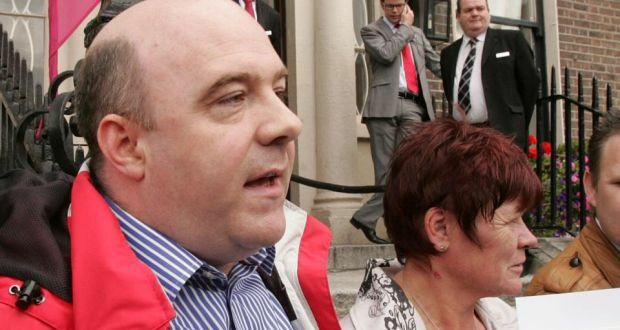 Browne had earlier led journalists into the grounds of the property, hours before the deadline given for O’Donnell and his family to leave. “Everyone come in. This is bank property,” the TV3 host implored the phalanx of journalists who had been camped outside the south Dublin house – after arguing with Beades over whether he should enter. “I don’t want to be at your press conference, Jerry,” he said, after being told he’d be barred from the land league group’s media event later that day. Asked whether his group (which was set up to help people whose family homes are under threat) had erred by staging a high-profile campaign at one of Dublin’s most expensive addresses, he said he hoped it would serve to highlight other eviction cases around the country. “If Gorse Hill this week put it on the map, thankfully Gorse Hill put it on the map,” he said.